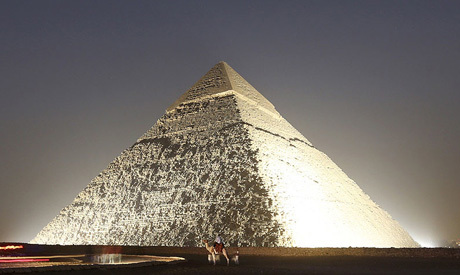 Egypt's administrative prosecution body has referred 12 former antiquities ministry employees to trial for allegedly allowing members of a German archaeological expedition to steal samples from the Giza Pyramids in 2013. According to a statement from the prosecution body, the 12 men, who worked in the pyramids department, will be tried in a disciplinary court. Investigators allege that the 12 men committed various crimes in 2013, such as allowing a group of Germans to illegally take a piece of a cartouche from a small compartment above King Kufu's burial chamber. The German group also took fragments from the walls and ceiling of King Kufu's tomb in the Great Pyramid, as well as fragments from another tomb. In taking their samples, the group used a sharp tool and damaged the antiquities, according to prosecution investigations. The 12 defendants are also accused of allowing the German group to enter unauthorized areas in the Giza Pyramids and take photos without permission. In November 2013, a documentary called The Cheops Project was published on YouTube, showing researcher Dominique Goerlitz and author Stefan Erdmann during their secret trip inside the Great Pyramid of Khufu in Giza. The documentary shows the difficulty they faced in reaching the cartouche. A sample of the cartouche was taken during the unauthorized expedition and was subjected to laboratory analysis in Germany. When the documentary was released, the antiquities ministry learned about the illegal expedition and imposed penalties on the two German archaeologists. The ministry described the incident as a serious violation of Egypt's ancient heritage and the Great Pyramid in particular – the only surviving monument of the Seven Wonders of the Ancient World. The ministry has placed a ban on any archaeological cooperation with Dresden University, which reportedly supported the work of the German archaeologists, as well as the scientific laboratory where the samples were analyzed. The findings of both archaeologists have been rejected by the ministry, which claims that the expedition was conducted by amateurs, not expert archaeologists. The German embassy in Cairo has also denounced the actions of the two archaeologists, stating that the researchers are not affiliated with the embassy or the German Archaeological Institute, nor do they represent any official mission from Germany to Egypt. In August 2014, the German authorities returned the stolen samples of cartouche to Egypt, handing them over to the Egyptian embassy in Germany.